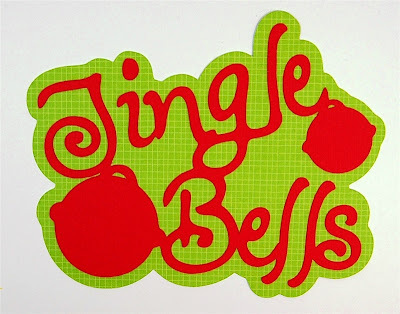 One of my favorite word art images on the 'Tis the Season cartridge is the "Jingle Bells" phrase. It just looks so cheerful and the sleigh bells remind me of the bells we have hanging on our front door (I put them up the first Christmas we lived in this house and we've kept them there ever since - I like being able to hear people coming and going). Most of the phrases on the cartridge have four layers. Here are all of the pieces cut and ready to assemble. The background mat is K and Company Halloween paper - it was just the right shade of green and had a nice subtle grid design. 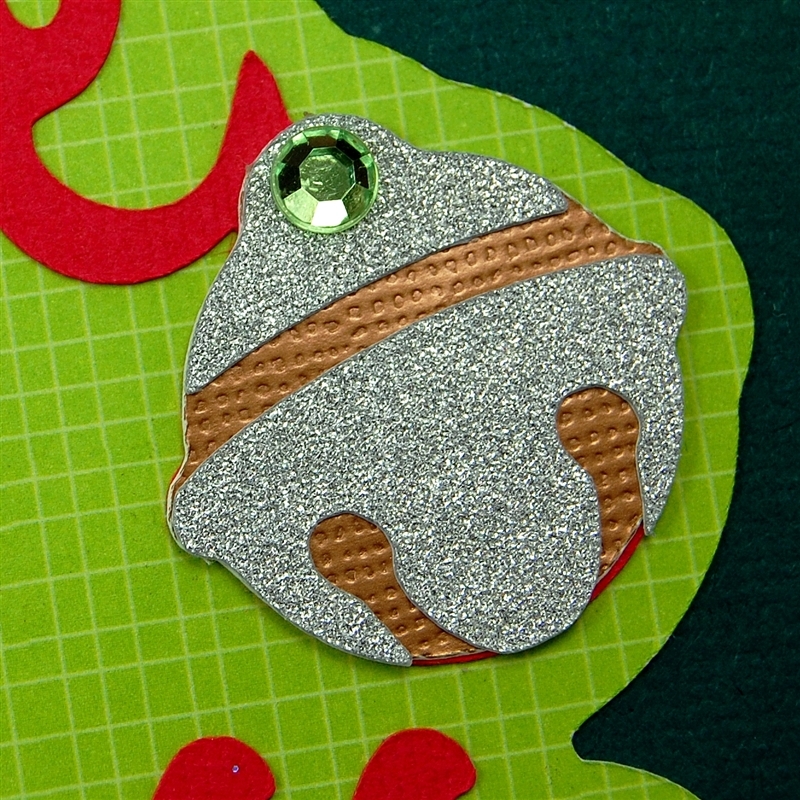 The lower layer of the bells is metallic DCWV cardstock and the top layer is a new type of glitter cardstock - I think I'll be using this a lot. 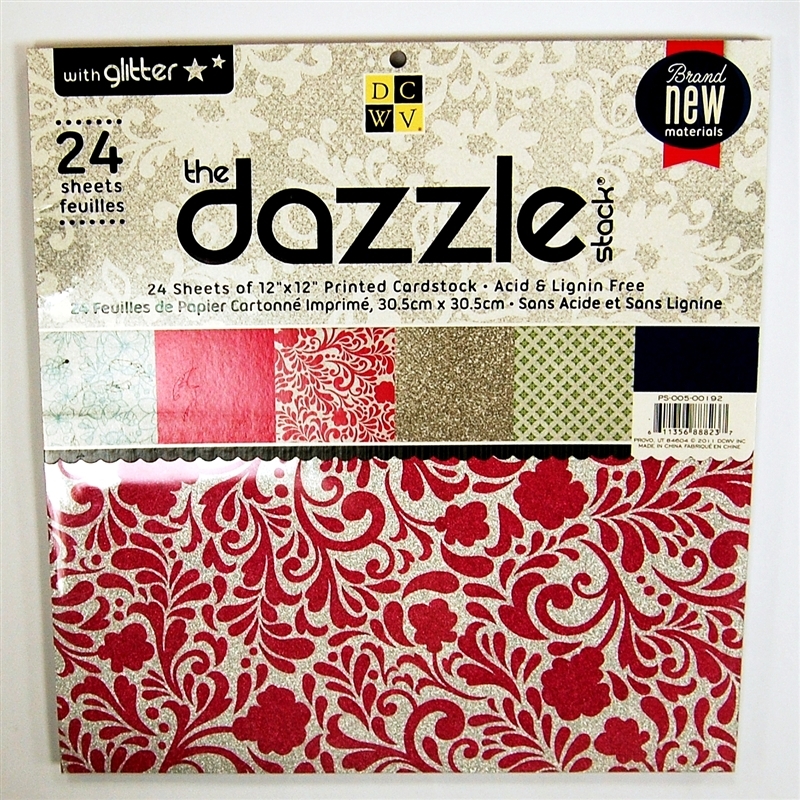 DCWV has new stacks of "dazzle" cardstock. 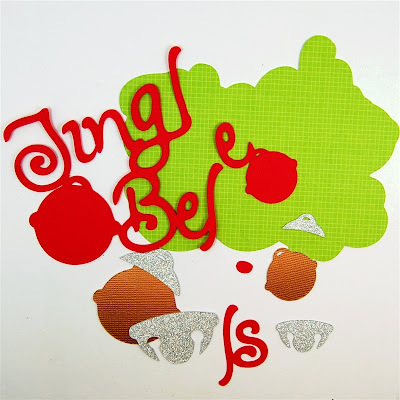 This has an amazing shine and is different from their regular thick glitter cardstock. The dazzle is soft and pliable and has almost a plastic feel to the backing. The "glitter" is incredible sparkly but the paper is smooth to the touch. The paper was easy to cut in the Cricut with a single pass - no multi-cut required. 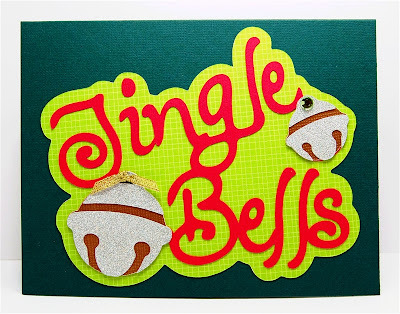 Here are the two jingle bells. The copper metallic base gives your eye a rest from the incredible shine of the dazzle top layer. The mat background for the phrase makes it easy to line up all of the pieces of the top layer. I cut this at 3 1/2 inches. 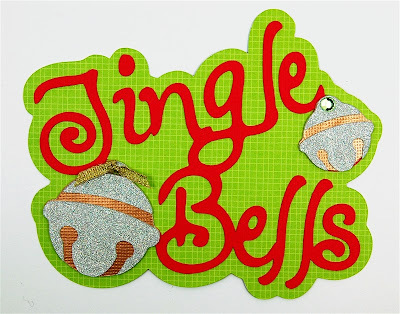 When I added the bells to the words I decided to thread some gold ribbon in the top of the larger bell and added a gem sticker to the smaller bell. I had to pry up the top a bit to add the ribbon - next time I'll tie it first. The slit at the top of the smaller bell was too tiny for me to get the ribbon through (it might be easier if I tried before it was stuck down!). I put a gem sticker at the top to finish it off. This would make a cute invitation to a caroling or sledding party. I thought the card was missing something even with all of the sparkle from the bells. I tucked a piece of sheer red ribbon with white polka dots behind the mat and tied a bow at the top left. This ribbon is from May Arts and it ties beautifully. I got it at our local stamping and scrapbook store, "Ink About It" - they have a good selection of May Arts ribbons. If you are interested in the 'Tis the Season cartridge you can see all of the pages of the booklet at by clicking HERE. I bought the Dazzle stack at Joann's just a few days ago. 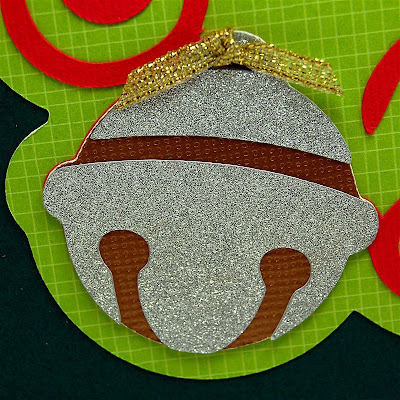 I have also seen a similar cardstock from American Crafts. These papers are fabulous for making your project special and they are so easy to cut in a machine with no glittery mess at all - I am a fan! You have to see the paper in person to really understand how it shines - I couldn't show the full effect in a still photo. I am still stiff and sore from the fall but felling a little better. Thanks for all the get well wishes. I also thank those of you who asked for my Dad's address to send a birthday or thinking of you card. He should be released from the hospital on Monday. Please send me an email at capadiadesigns@gmail.com if you'd like his address to send a card. Have a wonderful Sunday! So happy to hear you are recovering from your fall. Pretty darn scary event. 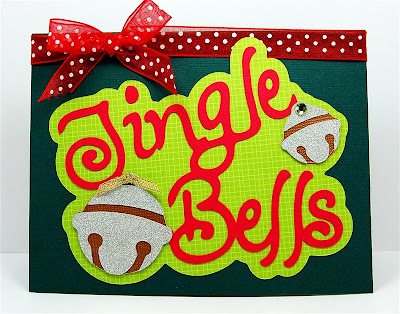 Your jingle card is so bright and pretty. That green is really wild! Ooooohhh! 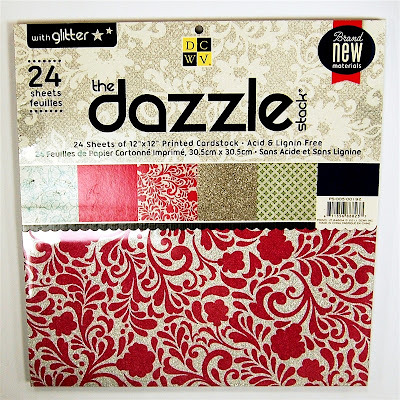 That Dazzle paper looks so wonderful! I didn't realize you fell on top of everything else going on! That's too bad! I hope you continue to feel better more each day! Thanks for all you do to inspire and inform! Great card. Love the bells! Super cute and so sparkly! Thanks very much for the inspirations. I love your website. 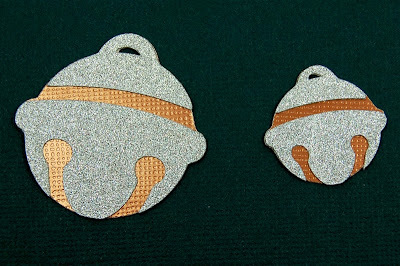 Love the bells - so sparkly! I love this new paper too - do you know if you can just buy the silver paper and not the whole pack? Thanks! Creative Charms projects - and a secret sale!